﻿IT’S OUR 15TH BIRTHDAY AND WE’RE GIVING YOU THE CHANCE TO WIN! This February, we’re celebrating the 15th birthday of our Fish Hoek store with big discounts, a long, 3-day birthday weekend and loads of exciting opportunities to win! 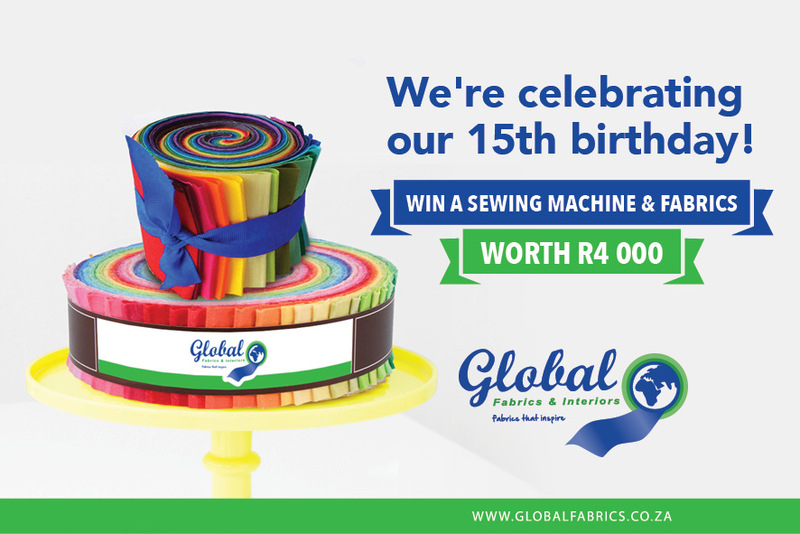 For every R250 you spend at one of our Global Fabrics Stores between Monday, 12 February and Saturday, 3 March 2018, you will receive one entry into our 15th Birthday competition lucky draw. Simply write your name, cell number and email address on the back of your till slip and pop it into the competition entry box at the Global Fabrics Store till point. Tag two friends that you think would like to win this prize in the comment stream below or share this post on your Facebook page. We will match up the name on your till slip to your Facebook profile to check that you meet these criteria. The competition will run from Monday, 12 February to Saturday, 3 March 2018 and the winners will be announced on Tuesday, 6 March 2018. Good luck! Only Cape Town based entrants are eligible to win. The winners will need to meet all of the criteria above to be eligible to win. The winners will need to collect their prizes from one of the two Global Fabrics and Interior stores. Should any of the prizes not be redeemed within one month Global Fabrics and Interiors reserves the right to select an alternative winner who is available to redeem the prize.